This Monday Apple announced the new MacBook Air and two short days later it has already been torn down by the iFixit team. What they found was that the new 13″ model is almost identical to the old one. even the model number was the same, which might make things confusing and the only external difference is the new microphone grill. Apple has added a second microphone on the new Air. Things on the inside looked pretty similar, but with newer components obviously. The big bump in battery life comes from Mac OS X Mavericks enhancements, Intel’s new Haswell CPU and a slightly bigger battery – 7.6V and 7,150mAh (up from 7.3V, 6,700mAh). 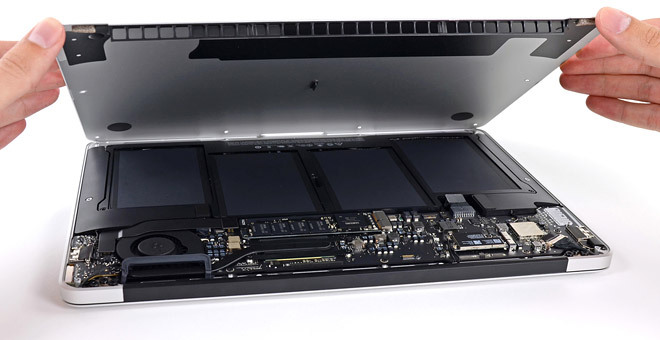 Another change is that the SSD is smaller – physically, not in terms of capacity. The 128GB SSD is hooked up to a PCIe port, instead of the slower SATA (just like competitor Sony Vaio Pro). Newer wireless tech is supported as well – 802.11ac at 5GHz and Bluetooth 4.0 thanks to Broadcom and Skyworks chips. Here’s a video overview of the teardown. For the complete step-by-step disassembly and high-resolution photos, you can hit iFixit’s site. The final repairability score is 4/10. That’s not very good and it’s mostly because of lack of upgradability – the RAM is soldered and if you bought a big SSD for your old MacBook Air you can’t use it on the new one. The proprietary screws didn’t help either.